The National Security Archive's blog Unredacted has an important post "U.S. Navy's History Program 'At Risk'" about a recent report of a Command Inspection of the Naval History and Heritage Command by the Naval Inspector General. The National Security Archive, which obtained the report via FOIA, has uploaded it here. historical records and artifacts are housed in a precarious environment, and invaluable archival material is in danger. The History and Heritage's Command's leadership has not been using due diligence to ensure that naval commands and fleets are creating historical records of their ongoing activities. 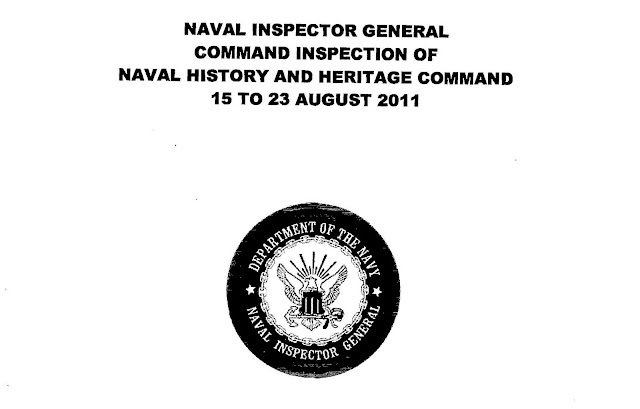 Moreover, according to the IG report, the Navy's professional historians, archivists, curators, and librarians who work for the history command feel "disenfranchised" because of "their marginalization in decision processes and lack of advancement opportunity. The Unredacted post also includes analysis of, and comments on, the report by William Burr and John Prados from the National Security Archive and Larry Berman from Georgia State University. a significant investment of time, effort and other resources is being focused on preparing for the War of 1812 bicentennial event; yet historical microfilm war records are being irrevocably lost due to their poor storage environment. The staff of professional historians is frustrated and believes their concerns are being ignored. The report also notes the "overwhelming backlog" of 68 years for archives and 30 years for art/artifacts for "processing and preservation" and warns of the difficulty of overcoming these issues "in an extremely constrained fiscal environment."